The 11th house rules your friends, groups, charity, and hopes and dreams. The sign on the cusp and planets in the house can show the kind of friends you're attracted to, the qualities you want in a friendship, and how you are as a friend. Any groups or organizations you belong to fall under the 11th house. Charity also falls here (mostly organizations as opposed to one person), though 'helping others' seems to be more in a distant way. What your hopes and dreams are for your life and future and how you treat them are all 11th house matters. This house is opposite the 5th house and therefore on an axis with it, and both house are social houses. The 11th house is ruled by Aquarius and Uranus, and is a succedent house. You’re a sociable person and enjoy spending time in groups and with your friends. You make friends quickly, but the bonds may not be very strong. You’re driven to achieve your dreams, and you have the energy needed to attain them. You probably don’t have a lot of friends, but you’re close to the ones you do have, and will keep them in your life for a long time. You take your time trying to achieve your dreams, and your dreams are likely about increasing your sense of security in life. You have a lot of friends, though they may be mostly casual, and need the social interaction for mental stimulation. When it comes to your dreams, you may have two specifically that you want, or go from one dream to the next quickly. You prefer having your friends over to your house, and love a small dinner party. You have a small group of close friends that are like family to you. Your dreams may include doing something to help people who are in need. You like to be the leader of the group, and shine with your friends. You have many casual acquaintances, but also a close group of friends that you’re loyal to. You dream of having status and being admired publicly. You don’t make too many close friends, but are loyal to the ones you have and willing to help them with whatever they need. You tend to be practical with your dreams, and try to figure out how you can realistically make things happen. You’re the one who helps everyone to get along with your friends, who organizes truces and plays the mediator. You have many friends, and you try to give them equal time. You can even marry a friend. You can vacillate with your dreams, unsure of what you want. You’re attracted to friends that are powerful and that share the same view of the world you have. You’re picky about who you become friends with, but loyal. You can become obsessed with your dreams, and work hard to make them happen. You have plenty of friends from all walks of life, but most of them are casual relationships. You want to be around people who you can have raucous debates with. You have big dreams, and no matter how big they are, they can fall into place easily for you. You don’t have many friends, but are close to the ones you do have. You may sacrifice friendships until you feel you’ve attained the goals you want in life. You work hard toward your dreams, trying to make them a reality, and don’t need anyone’s help. You want to be around people who are interesting, innovative, and original. You thrive in a group setting, and can be a bit of a rebel. Your dreams tend to be unusual in some way, and you can take unusual steps to achieve them. You’ll do anything for your friends, but need to make sure that you see them for who they really are, and accept them as such. You’re very charitable, and will give far more than you have. Your dreams tend to involve helping others, or are wildly fantastical. With your natal Sun in the 11th house, you’re more tolerant than most people, and don’t look down on anyone. You believe everyone is equal to you, no matter who they are. You try not to judge people, and are attracted to people who are different, original, and unconventional. Your social circle is diverse, and you’ll befriend people from all walks of life. People see how open you are, and that attracts them to you, but you can have trouble opening up your true self to others. You may choose friends over a lover, valuing your friendships, and work well in a group. You’re always looking towards the future, and you have great dreams and hopes for how you want not only your future to be, but also the future of the world. It’s likely you are someone who always has a cause, and can be a fervent supporter of something. Once you become emotionally invested in a cause, there’s no backing down. You’ll be a heartfelt devotee til the end. Some may not stick with one thing though, bouncing around from one to the next. You care a great deal about others though, and want to help when you can. Your friends are very important as well, and they can almost be like family (especially for those with harsh family ties). They give you a lot of support, and you give plenty in return. You may be friends with many different types of people, loving diversity and eccentricity. If your friendships are on the rocks, then it’s likely due to an internal emotional problem you’re having. How you view the future and what your dreams are can be tied to your emotions, and may fluctuate with your feelings. You only want the best for everybody, but you may not be set on anything very long, and at times this may make some of you seem superficial, because you just go with what’s the fad. With your natal Mercury in the 11th house, you’re attracted to innovative, original ideas and thinkers. You want people in your life who challenge conventional thinking and force you to think outside of your own box. You respect people who seem intellectually advanced. You’re always looking towards the future and making plans for your future dreams, though your dreams may change frequently. You could have two separate, distinct dreams for your future. Friendships tend to be more casual and superficial, and you like people who are chatty, though they may not be very loyal. You can be idealistic, and want people to treat each other well. With your natal Venus in your 11th house, you like to be friends with someone first before getting involved with them romantically. You can stay friends with them after you break up, and it’s important for you to have an intellectual connection with someone. You want someone who’s an individual, who’s original, and who’s unusual. Quirky types are right up your alley. You value your friends and are highly sociable. You may belong to many groups because you like the feeling of belonging. You may be a humanitarian, and like doing work that helps people or the planet. With your natal Mars in your 11th house, you work well with others, and this can help you to get what you want. You may need others to help you achieve your goals. You’re focused on the future, and have the energy to go for your dreams. You have a large social circle, many casual acquaintances, but perhaps not many really close friends. You can be idealistic at times, and want to do what you can to make the world a better place. There’s a humanitarian in you, and at some point, you can become passionately involved in a cause. With your natal Jupiter in your 11th house, you love being in groups and spending time with your friends. You may belong to many groups, always socializing and meeting new people. You’re open to people from all walks of life, and this tolerant attitude draws people to you. The friends you have or groups you belong to could help bring you success in life. You want to help people as a whole, doing your part to contribute to society, and may be involved in a humanitarian effort or charitable cause. You want everyone to have the chance to live their life as they wish. With your natal Saturn in your 11th house, you may be a loner to a degree. Making friends is difficult for you, and you can feel uncomfortable in social situations. You can’t stand superficial connections, so any friendships that you do have, you take quite seriously, and you keep them for life. They need to be stable, reliable people. You value who you are as an individual, and you don’t want to blend in and be like everyone else, but it can cause you to reject everyone else to try and make yourself seem more special. Insecurity is the root of the problem. 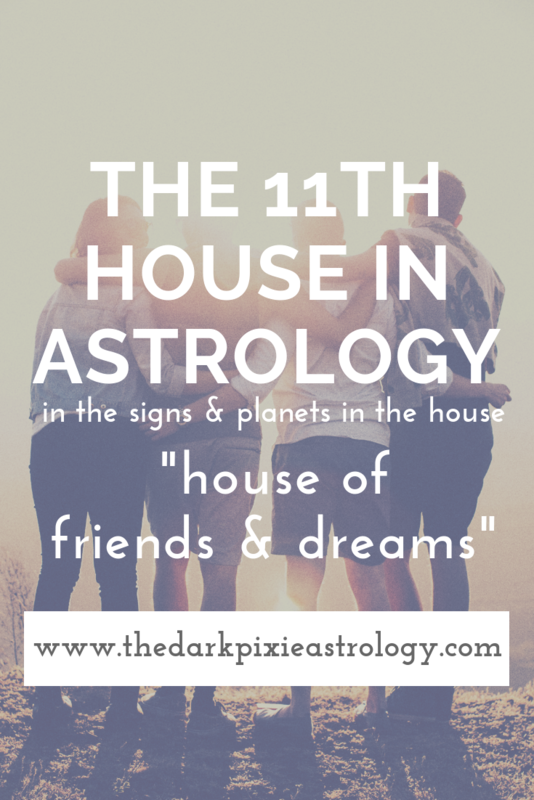 The 11th house also rules your dreams, and Saturn here can delay you getting your dreams until later in life, or cause you to not commit yourself to any dream. Release the fear that holds you back. With your natal Uranus in your 11th house, you’re too freedom-loving to tie yourself to friends too much. You may have many casual friends, but aren’t close with any of them. The people that you like most are ones who are innovative, original, and their own person. You can dazzle a crowd, but have issues actually connecting with people on an emotional level, and look down on people who aren’t as open to new ideas as you are. When you’re around people who share your beliefs and who want to work with you towards a shared goal, you can flourish, as long as they don’t stifle you too much. With your natal Neptune in your 11th house, you’re open to having all sorts of friends, but this can lead you to be taken advantage of by people who you think are your friends but are just using you. A real friend won’t try to get that much from you. Set boundaries and make sure they have good intentions before you give so much away. When it comes to your hopes and dreams of the future, you can have a hard time seeing your goals clearly, or feel that once you attain what you thought you wanted, it isn’t what you want anymore. You can be a great humanitarian, extremely compassionate and thoughtful, and see the world with hopeful eyes. With your natal Pluto in your 11th house, you may try to control your friends or vice versa, or belong to groups where you’re the master and everyone follows your lead. You can captivate large groups of people. You can be obsessed with your future dreams, and can be a great humanitarian. You can inspire people to be better and make a difference in the world, but you need to make sure you have strong beliefs, and don’t just go with other people’s. With transit Mercury in your 11th house, you come up with your best ideas when you’re working in a group. You need many people around to bounce ideas off of in order to use your mind to its fullest potential. The ideas that you come up with now tend to be more unconventional, and you come up with innovative solutions to problems. You’re drawn to original ideas and concepts, and ones that seem futuristic. You may spend more time than usual dealing with technology, especially the internet. You may have more communications with your friends, or with groups that you belong to. You can spend time thinking about your future, and planning for that future. When transit Mars is in your 11th house, you’re driven to innovate, dream, and hope. You take a totally different approach to situations, and are more enthusiastic about ideas that are considered futuristic and strange. This is a good time for working in a group that holds the same beliefs you do towards a common goal. Working in a group may be the only way you can accomplish anything during this transit. You can do good humanitarian work during this time, and are quite busy with a packed social calendar. You dream more about your future, and what you’d ideally love to have happen. You can work more towards those dreams, and have more energy and drive to accomplish them. When transit Saturn is in your 11th house, you may see many friends and acquaintances leave your life. You’re not satisfied with superficial relationships, and this aspect cleans them out. The people who leave aren’t as good for you as they should be, though you may feel lonely at first. You want more meaningful friendships and connections with people. You can become more focused on your future, and your dreams. You may give up on one of your dreams at the beginning of this transit, believing that it’s not realistic enough. It would be better to work hard towards your dreams, and take a slow but steady approach. You’re more practical and realistic with what is required of you to achieve your dreams, and this can help you make a successful plan to attain them. You can dedicate yourself to a cause during this time, trying to find your place in the world. When transit Neptune is in your 11th house, you want plenty of friends, but have a hard time picking ones that will treat you right. You give in to their demands, and sacrifice too much of yourself for them. You’re drawn to people who are spiritual but out there, and can become too clingy. You may see some friends leave your life during this transit. You need to figure out where you belong in the world, and let your dreams soar to new heights.